Everest 2018: Summit Wave 9 Recap – More Sherpa Deaths with Summits Everest 2018: Wave 11 Recap – All over after 11 Straight Summit Days! For the 10th straight day, there were summits on Mt. Everest. It all began on 13 May when the Sherpa rope fixing team summited from Nepal, then on the next day the ropes were fixed on the Tibet side. With the door wide open, teams took advantage of an advantage streak of suitable weather. And even today, 23 May, there were more summits on Everest but climbing in late May has serious concern as it is warm. Sangeeta S Bahl told me about her trip through the Icefall on 22 May after summiting the previous day, “But coming down yesterday there were rivers flowing. Very soggy n slippery. I took that extra one hour to come down in one piece” This is par for the course in late May. Global Rescue who runs perhaps the largest rescue service on Everest has staff positioned all across Nepal during the peak climbing season. Ann Shannon, Manager, Public Relations, sent me this video of a major avalanche that hit the upper part of the Khumbu Icefall Wednesday afternoon. No injuries were reported. This is the main reason people avoid being anywhere near the Icefall in the heat of the afternoon. Summit Climb got their team to the summit early Wednesday morning. 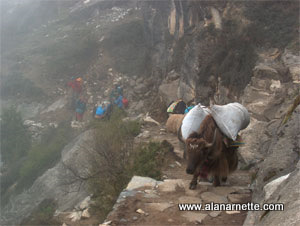 They have not specified how many members and Sherpas summited. A Nepali Female Journalists team also summited Calling themselves “First Women Journalists Everest Expedition 2018″ , Rosha Basnet of Rastriya Samachar Samiti, Kalpana Maharjan of Mega Television , Rojita Buddhacharya of Nepal Television and Deuralee Chamling, a freelancer, summited guided by Phurba Tenjing Sherpa of Dreamers’ Destination. If you ever wonder how someone is rescued from high on the mountain, this video shows the ride. If possible the helicopter will land and the individual will be place, or climb in on their own, into the helicopter. Often the chopper is stripped of all excess gear and the seats, except for the pilot’s, to reduce the weight. They land as high as Camp 2 at 21,000’/6400m on the Nepal side, however at times they lower a long cable and the ground crew attaches it to a stretcher holding the injured person, then they fly lower. This is a video posted by EverestEr showing a “long line rescue” from near Camp 3 around 23,500’/7162m by pilot Maurizio Folini and Lakpa Norbu Sherpa, a longline rescue specialist. Can you imagine taking this ride? Montagna.tv has a good piece on the tragic death of Damai Sarki Sherpa who fell into a crevasse near C2 while helping a member reach a helicopter for an evacuation. It appears the helicopter otter touched down on a open crevasse that was difficult to see. Well, its still not over. I’ve confirmed that Rupert Jones Warner is in Tibet for his double Everest attempt. He summited from Nepal on 17 May. He may have already summited, or at least made an attempt, if not then they may be alone on that side. Unclear on the status of Horia Colibasanu and Peter Hámor on the Nepal side hoping to summit via the West Ridge then traverse to Lhotse. No current updates from them. UPDATE: They have cancelled due to conditions. And finally, Tenji Sherpa and Jon Griffiths, should be at C2 today, Wednesday in Nepal. Look for their live stream of Everest/Lhotse on the Nat Geo Facebook page. As I’ve said many times, it’s not over until its over! Finally super photo by Jagan Timilsina ! Yea, this has been great. I look forward to reading your entries. Though sometimes a sad story, I’m always on the lookout for your updates. Me too Crystal. Absolutely loved reading every post. Please keep it up Alan. This was my first year following your coverage in real time and I must say it has been superb! I love all the pictures and videos! Looking forward to reading next year’s coverage as well! Which Everest route would you prefer to climb?